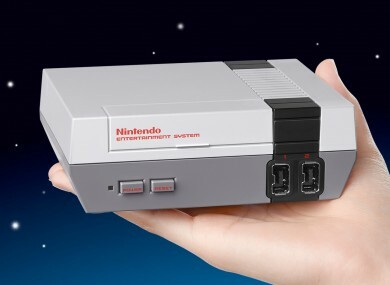 The NES is making a return and it’s small enough to fit in your hand. NINTENDO MAY BE planning to release its next-gen console in March, but in the meantime, it will be released a smaller version of a classic. The Nintendo Classic Mini is a condensed version of the classic NES console which was released back in the 80s. The updated version is small enough to fit in your hand and comes pre-loaded with 30 games, including the Super Mario Bros series, Megaman, Metroid, The Legend of Zelda, Kirby, Donkey Kong and Punch-Out. More importantly, it comes updated with a few extras to make it more user-friendly for the current generation. As well as coming with an HDMI and USB cable (the latter for powering it), and if you have a Wii or Wii U, you can connect a classic controller to it to play them as well. The biggest inclusion will be the introduction of save states. Games in that era were not only unforgiving but lacked many of the luxuries that we take for granted. Being able to save at any point in the game, and have multiple slots, will go a long way in removing the frustration you would associate with such games, most of which weren’t released with a save function. Some of them like Ninja Gaiden and Super C were incredibly tough games to play so having save states will make things more bearable, the rest more entertaining. Retro gaming has been embraced by the industry in recent years with compilations from the likes of Rare released on modern consoles. SEGA and Atari have released plug in and play controllers based on the Mega Drive and Atari 2600 while Nintendo also embraced retro gaming through its virtual console network, which included games from the NES, SNES, Mega Drive and N64. The bad news? It won’t be released until 11 November, but at least you’ll have something to look forward to when the nights are longer. Email “Nintendo is bringing its classic console back for the modern generation”. Feedback on “Nintendo is bringing its classic console back for the modern generation”.